Mascarpone (mascherpone) is Italy’s most famous fresh cheese. 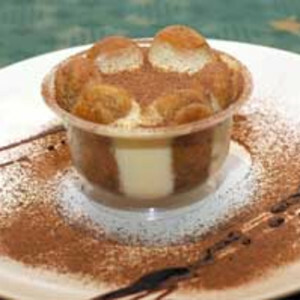 It is more expensive than cream cheese and is the basis for such desserts as tiramisu and as a filling for cannoli. Smooth and buttery with icing-like qualities, mascarpone is truly a step above other unripened cheeses. An exceptionally high fat (double- or triple-cream) content also contributes to the delectable taste that goes well in creamy soups and pasta sauces. Produced mainly in Italy’s Lombardy region, Switzerland, and the United States, typically from pasteurized cow’s milk. Some harder-to-find products are made from water buffalo milk. Coffee-infused “tiramisu mascarpone” may be available regionally. Look for eight-ounce plastic tubs in deli sections or gourmet markets. In Italy, it is wrapped in cheesecloth. Keep refrigerated and use within a week of opening. Use instead of cream cheese or heavy cream in most recipes. Add to homemade ice cream. Like cream cheese, but ultimately richer and more spreadable, mix in herbs or spices and top toasted baguettes. Spoon onto hot pasta, add parmesan and toss.